There’s been talk about Twitter being the “pulse of the web”, and there is no doubt that the real-time web and real-time search are burning hot trends. At the heart of Twitter are its status messages, more commonly known as tweets, where people express opinions, share links and let people know what they are doing. Tweets are like the vital red blood cells in Twitter’s stream of information. So how many tweets are pulsing through Twitter every day? When do we tweet the most? Read on to find out. To be able to make this report, we built a small application to track the number of tweets sent on Twitter. We let this run for three weeks, during the period October 21 – November 11, to see what kind of interesting data we could find. How many tweets pass through Twitter? As we explained above, we have tracked the number of tweets sent on Twitter for three weeks. 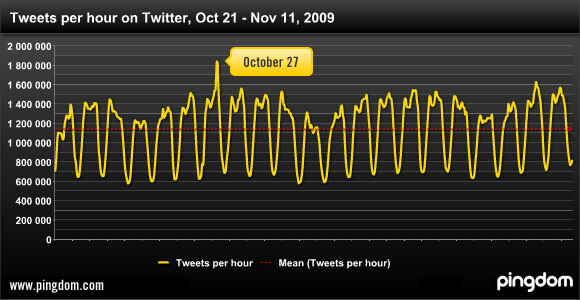 During this time period, the average number of tweets per day was over 27.3 million. The average number of tweets per hour was 1,138,772. As you can see by the above graph, the amount of tweets per hour differs greatly depending on the time of day, and even day of the week (more about this later). The highest number of tweets per hour we measured was 1,841,289. This peak happened around 8 p.m. EST on Tuesday, October 27. We have a sneaking suspicion this had something to do with either baseball (MLB) or some American TV show, because it was in the middle of the night in Europe. 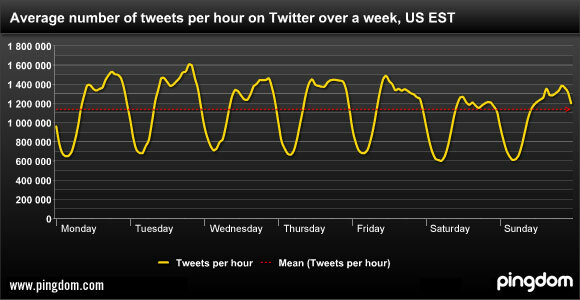 In contrast, the lowest number of tweets measured during the period was 566,854 per hour (during night time in the US). 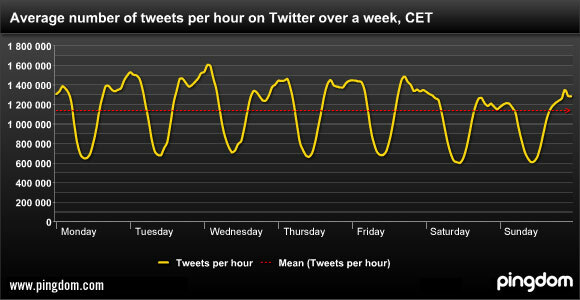 This means that the busiest hour during this period had more than three times as many tweets as the calmest hour. At the current rate, Twitter will process almost 10 billion tweets in a year. Of course, as Twitter keeps growing, it will most likely exceed that by far. Now let’s have a look at some of the data we extracted to see when we tend to tweet the most. Which days do people tweet the most? Since there are slight variations from week to week, for example depending on events and holidays, we thought it would be nice to see what a “typical” week would be like in terms of Twitter activity. To accomplish this, we averaged the results for each hour for the three weeks of data we collected. That way you get to see what an average week looks like. For your convenience, we have made two graphs, one showing European time (CET) and one showing US time (EST). Note that it’s the same graph, just shifted depending on time zone. 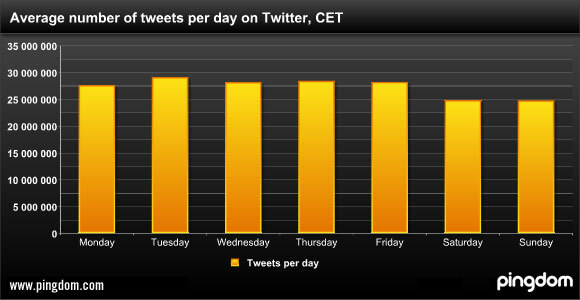 As you can see, although the general pattern is the same for all the days, the amount of tweets is different. To make this even clearer, here below is a diagram showing the number of tweets per day (also averaged over three weeks). It’s based on European time, but the US version is close to identical so we just included this one. It’s not hard to see that weekends see fewer tweets than regular weekdays. The difference is several million tweets. When during the day do people tweet the most? If you average a set of days (in this case a three-week period) you get a pretty good overview of what a typical day looks like on Twitter in terms of activity. 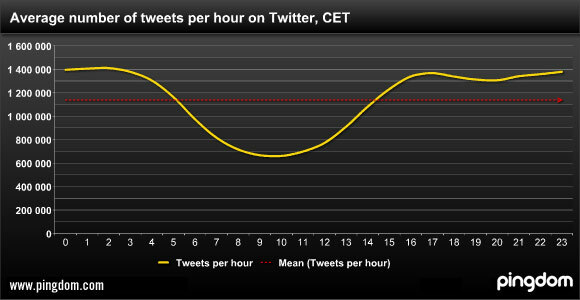 For your convenience, we have once again made two graphs, one showing European time (CET) and one showing US time (EST). Just like before, please note that it’s the same graph, just shifted depending on time zone. Note how the dip takes up much of the early day in Europe, when it’s night in the US. It doesn’t take off again until the afternoon in Europe, when morning arrives in the US and that part of the Twitter population starts tweeting again. 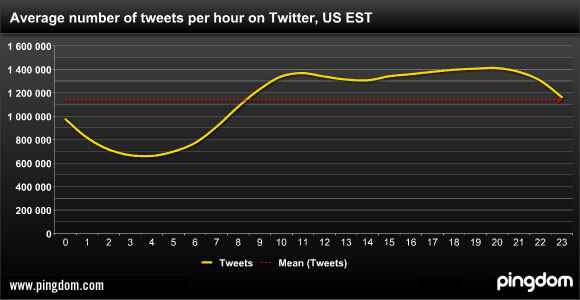 The graph here below, shifted to show US eastern time, shows clearly that the dip occurs during night time in the US. Although the graphs mostly speak for themselves, here are a few observations we couldn’t help sharing with you. American dominance. That the United States is still a dominant force on Twitter becomes clear when looking at how the tweets are spread over the day. Night time in the US brings with it a significant slowdown in tweeting activity. As Twitter grows more international, this might change, but as of now, Twitter’s core user base is clearly still American. People tweet a lot at work. We can’t explain it any other way, since weekends show decreased Twitter activity. The scaling challenge. In terms of scaling, we suspect that the amount of tweets passing through Twitter is not an issue for the service right now (the Fail Whale is a much rarer sight these days than it was in 2007 and early 2008). Any scaling challenges that Twitter has are most likely caused by the spreading and delivery of that data – data indexing, API calls from various apps, all the website visitors, tracking who should see whose tweets, etc. There’s an awful lot of extra work that Twitter has to do behind the scenes for each tweet. We hope you found this report interesting. It seems like these days everyone and their grandma is using Twitter (including us, check out @pingdom) so we think it’s nice to be able to examine trends like this. As you know, Twitter has been growing like crazy in 2009 and is a moving target. Considering it’s already closing in on 30 million daily tweets, 2010 will be an interesting year for Twitter. Here’s something to think about: Once Twitter reaches 33.3 million tweets per day, the service will be processing a billion tweets per month.